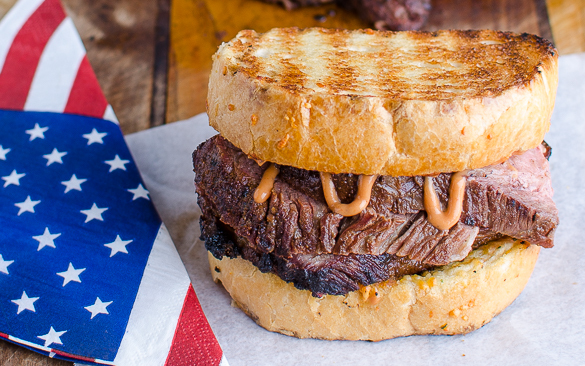 California meets Texas in this interpretation of a Santa Maria salty garlicky beef tri tip that’s paired with cheesy Texas Toast cooked in a Weber Kettle. 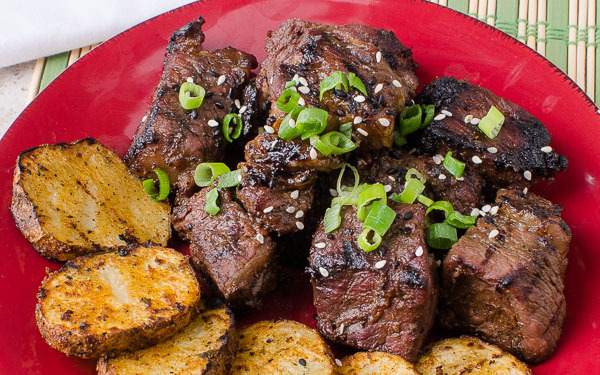 I’ve upped the ante on the beef quality thanks to the kind folks are Snake River Farms who graciously provided their Waygu Tri Tip for this fast-easy dish to make for a summer party. For a primer of what Wagyu is, please read my A5 recipe. Add some sparklers and you’ve got a festive July 4 Independence Day crowd-pleaser ready to impress your guests! 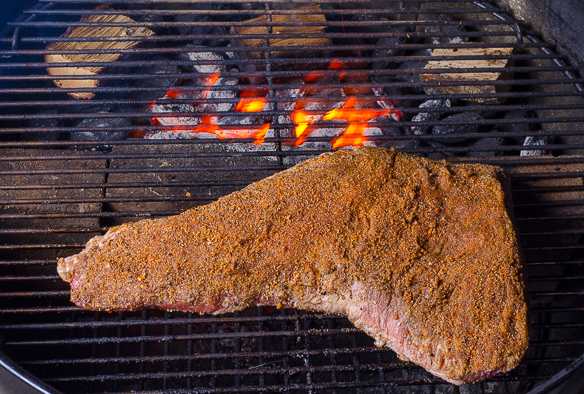 For those less familiar with beef tri tip, it’s a 12-inch boomerang-shaped muscle located near the bottom sirloin. It’s popular and common in the Santa Maria region of California between Los Angeles and San Francisco. It’s often cooked on Santa Maria grills which has a large cooking grate mounted on a chain and wheel system to allow the meat to be lowered or raised above a smoldering fire of California red oak logs. You can use hickory or pecan as good substitutes. It comes trimmed or un-trimmed and I highly recommend you purchase the trimmed version even though it’s more expensive as it’s a chore to trim it yourself. Be sure to trim off any silver skin or thick fat as those won’t taste very good and will prevent the rub mixture from adhering to your meat. 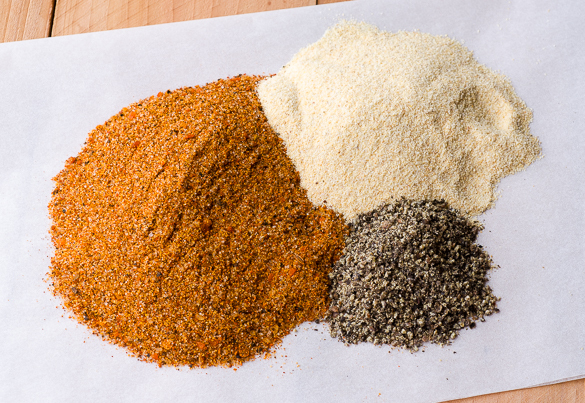 The rub combination was adapted from the one I used to win the Tri Tip Championship in Santa Maria. 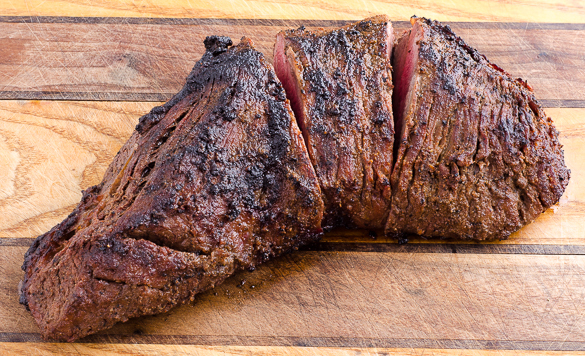 For more background on this style of cooking, read my Cowboy Coffee Tri Tip recipe. 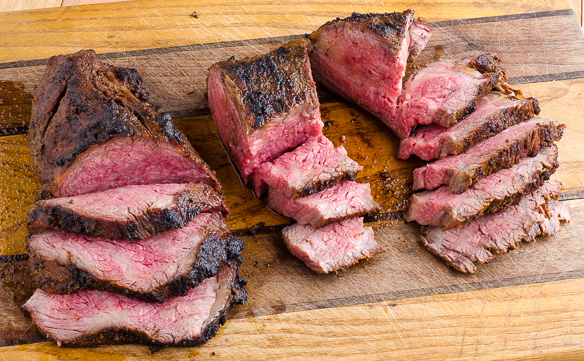 In other parts of the US, this cut is sometimes called butchers cut as the butcher saves this portion for his or her family. It’s typically ground up or cut into steaks. Since it has little connective tissue, it’s tender and is cooked like a steak. You can go through the effort to make your own Texas Toast but I find it much easier to purchase packs of frozen ones for less than $2.00. When I have pool parties, I cook a bunch of whole seasoned tri tips and keep them warm. Guests can slice the meat for themselves and pile on as much as they want. I give my guests a primer on how to properly slice tri tip 90 degrees across the grain (see photos below). For kids who want to learn how to slice meat under supervision of parents, I have them put on a cut-resistant glove ($10) and a vinyl glove on top of that. Yes, it’s self service at my parties. A toasted buttered baguette works just as well. 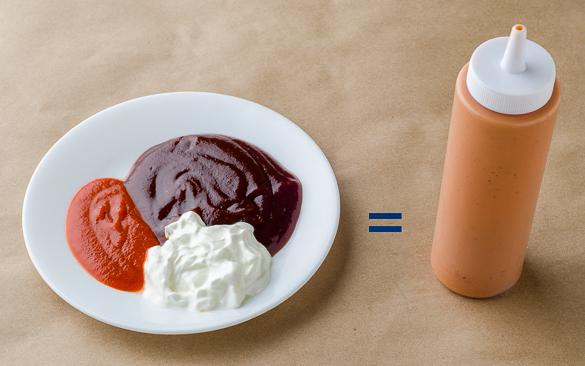 I like a spicy kick so I usually have some hot sauce handy or a creamy BBQ Sriracha sauce standing by (recipe included below). Combine the rub in a shaker jar. 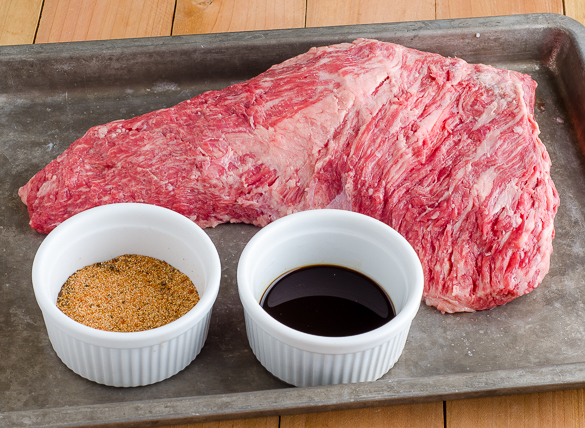 Coat the entire Tri-tip with the Worcestershire sauce (to better adhere the rub). 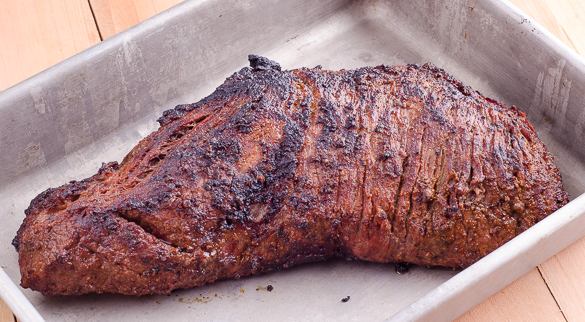 Apply coat of the rub on Tri-tip and Rest 1 hour in fridge. Prepare optional spicy drizzle sauce. Grill indirect at around 275F until internal temperature is 110F. (Add a few Santa Maria red oak wood chunks to the charcoal if possible. If not, use another red oak, or alternatively hickory/pecan.) This will take about 45 minutes depending on grill temp. Rest the meat 20 minutes under loosely tented foil. 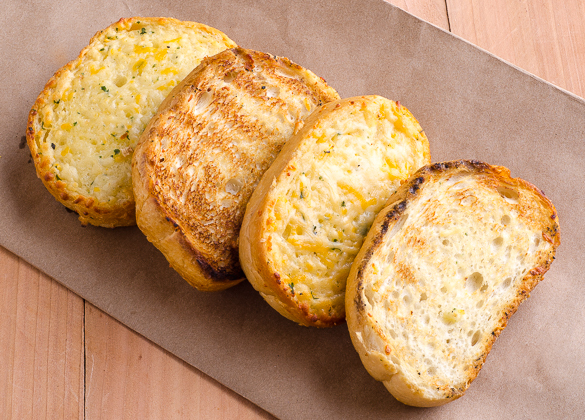 While meat is resting, grill indirect the frozen cheesy Texas Toast in approximately 425F degree heat, until browned. 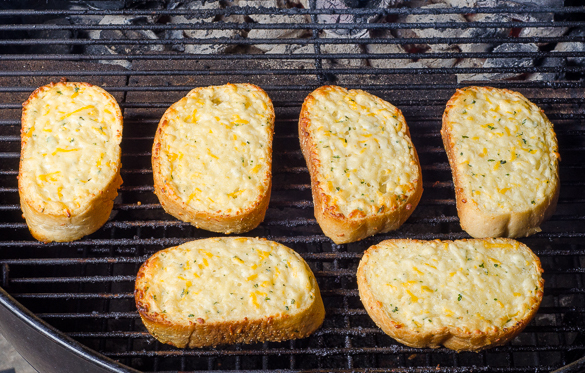 Move the toast over the hot coals for about 3-5 seconds to get some nice brown grill marks. 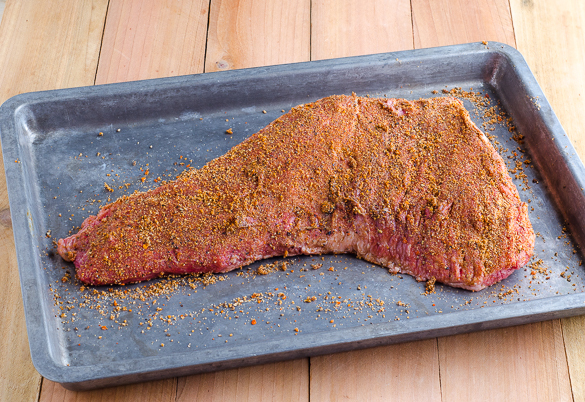 Cut the Tri-tip boomerang into three pieces along the grain first. See next photo. Then move your knife by 90 degrees to slice each of the three pieces across the grain in ⅛ to ¼ inch thick slices, as shown in next photo. 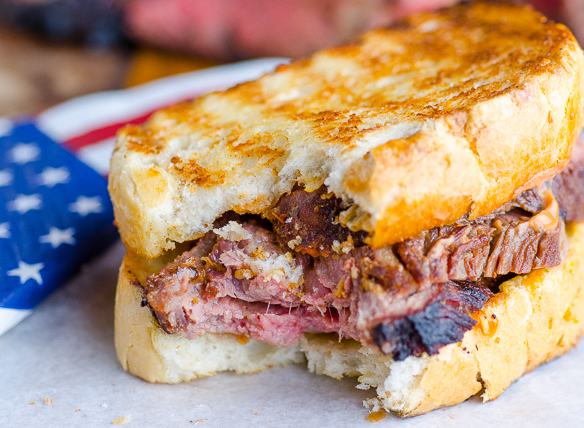 Pile Tri-tip slices onto Texas Toast. Drizzle on the optional spicy sauce. 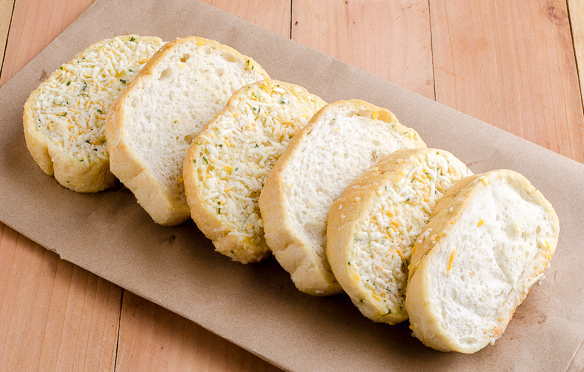 Top the sandwich with another slice of prepared Texas Toast. 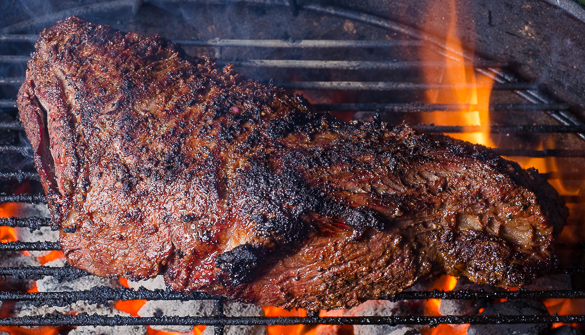 Tri Tip (Santa Maria Steak) is traditionally cooked with with Red Oak. Being from Texas I made mine with Post Oak and turned out wonderful. Is the flavor profile similar between the 2 woods or different? Thanks Again Harry. This is the best Tri tip sandwich I’ve ever had. Thank you for sharing your recipe.